Let your summer gardens dazzle with Monrovia’s Cherry Dazzle Crape Myrtle, a great dwarf variety that will be a show stopper in any sunny garden. 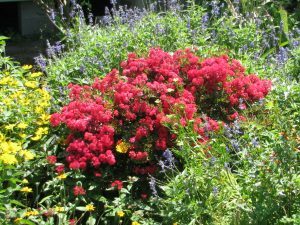 This photo shows it paired with Summer Sun Heliopsis, Henry Duelberg Salvia, and David Verity Cuphea. The dwarf crape myrtles are a wonderful, and underused container plant. For your application, they should provide great summer color, and can always be under-planted with additional selections such as pansies or violas in the winter and blue daze, verbena, or purslane for the summer.